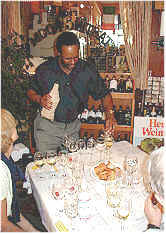 This tasting featured older bottles of wines from various participant's cellars, focusing on 1988 and 1993 vintaged Chardonnays. We found the wines to be somewhat different from today's California Chardonnay. 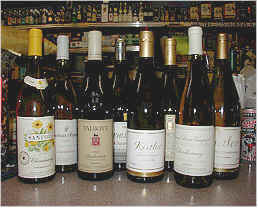 The wines of yesterday were a percent or so lower in alcohol than the wines on today's market. Also, virtually all the wines in this tasting were found to be dry. That being said, if this tasting is any indication, you probably should consider drinking most California Chardonnays within a few years of the vintage. 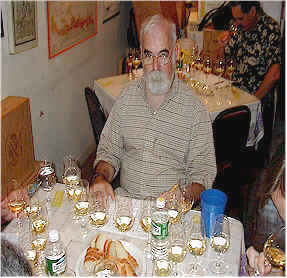 This sort of forum, as one taster pointed out, served to magnify the oddities (or flaws) of the wines. Almost all, on the other hand, might have been better-received alongside food at the dinner table. The first taster described this as "weird." When I asked them to elaborate, they said "It's very weird." Another person found this to be oxidized. Another found elements reminiscent of a Belgian ale or sour mash whiskey. "Stewed rhubarb, berry and yeasty notes." said another taster. Someone else likened the fragrance of this to chamomile tea. 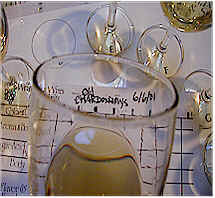 I found skunky, beery, yeasty, stale aromas and tired and spent on the palate. "Sulfury." said the first critic and this sentiment was echoed around the room. "A Meursault-like 'stinkiness." said someone else. Another taster found "citrusy notes, flinty elements, sourness and a stony minerality." "Green apple fruit." was how another taster described the Fogarty, while another person explained how Santa Cruz Mountains Chardonnays tend to have high levels of malic acid. I found a Champagne-like fragrance to this, the wine showing some leesy and yeasty notes. On the palate, the bready, biscuity flavors dominate. "Made in a Burgundian style, this has a fragrance of roasted oats and a stony flavor with a short finish." said one critic. One person found a "sulfur stink" in this wine. Someone else described it as "Chablis-like but it's been over-sulfured and suffers from arrested development. Arrest the winemaker!" Another found it "lean and bitter." My impression was of the fragrance of taco shells or corn chips. Break out the salsa! Bizarre. "This shows a delicate, sweet lemon meringue fruit and it improved with airing, having a creamy, full mouthfeel and pippin apple flavors." said one participant. "Buttery nose, vanillin oak and minerally fruit." said another. A third taster found "Butterscotch and caramel." One critic complained this had "too little fruit." I found smoky notes with a Cognac, rancio fragrance. On the palate it was old, faded and had a mildly apple-like flavor. "Creamy, citrus, honey, tropical fruit and layers of concentration." were the adjectives used by one defender of this wine. Someone else complained that "Sherry-like notes appear in this wine." One person found vegetal notes, while another described it as having tropical fruit fragrances. "Canned peaches." said someone else. "Lemon sherbet." said another fellow. I found old, honeyed, waxy notes, reminding me more of a Semillon wine. A fair bit of vanillin from the oak appears on the palate. "There's no 'there' there." said Gertrude Wein-Stein (or someone in the group). Another person felt this "...is classic California Chardonnay, but it's one dimensional." "Round and balanced, but there's nothing here." said another taster. Yet another person found it "empty and over-ripe." I found this charmless wine to have a cooked, stewed apple fragrance and it was lean, acidic and wiry on the palate. 2nd Place: SANFORD 1988 Santa Barbara County "Barrel Select"
"Toasty nose, creamy, citrusy, tropical fruit, lemon custard pie with a long, lingering finish." were the notes of one taster. "Tropical and ethyl acetate." said another and this was seconded by another taster who found it "volatile." "Sour and sharp." added another. I found that volatile, sharp character and described the fragrance as reminiscent of band-aids. I find this periodically in a number of Chardonnays from Santa Barbara. I think it's the winemaking, more than a "terroir" issue. The flavors show brown butter and mildly creamy notes. 1st Place: KISTLER 1993 Sonoma Valley "Kistler Vineyard"
"Honey and butter with rich, toasty, smoky, buttery nuances--quite Burgundian." said one taster. Another felt it "...doesn't have a lot of fruit." A third person found an element they described as reminiscent of a "bacon smell...a smoky note." Someone else found a hint of "menthol." Another got "toasty oak," while someone else said this was the "only wine with lots of fruit, clearly having the best focus." Another person said this is a "rich complex wine, but better when freshly poured." I felt it was the only wine of the tasting with a shred of vitality to it...truly a breath of fresh air with sweet, vanillin oak and bright, appley fruit. The same notes are present on the palate, making this a two star wine (on a scale of three). Time to drink it, though!